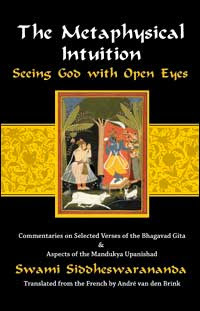 These unusual and moving commentaries on chosen verses of the Bhagavad Gita masterfully unlock the sacred text’s mystical insights. These are last writings of the extraordinary Swami Siddheswarananda, who was born into the royal family of Cochin, Kerala, India, and became a monk of the Ramakrishna order. He spent most of his life, however, in service to French adherents of Vedanta. He founded and, until his death, was the spiritual head of the Centre Vedantique Ramakrichna in the picturesque river town of Gertz, France. This book is the culmination of a lifetime of spiritual search and includes commentaries on aspects of the Mandukya Upanishad. In these teachings, the Swami seeks to convey an experience of an intuition operating beyond logic, outside the play of opposites, through which seekers can more readily sense the nature of reality. To elucidate his meanings and to make them broadly accessible, the Swami draws on the writings of others including Meister Eckhart, Ramana Maharshi, Adi Sankara, Hubert Benoit, and Sri Ramakrishna and Swami Vivekananda. Originally written in French, we are publishing the first English translation internationally under the ARUNACHALA PRESS imprint, as a co-publication with Monkfish Publishing Co., Rhinebeck, NY, and the Indian edition under the Editions INDIA imprint. ISBN: 81-89658-01-8; Price: Rs. 295; Pages: 192; SIZE: 5.5 x 8.5 in. !! Swami had great regard for Sri Ramana Maharshi. He founded the Ramakrishna Ashrama in Gretz Centre Vedantique Ramakrichna), France in 1947 and spread the message of Vedanta in French.